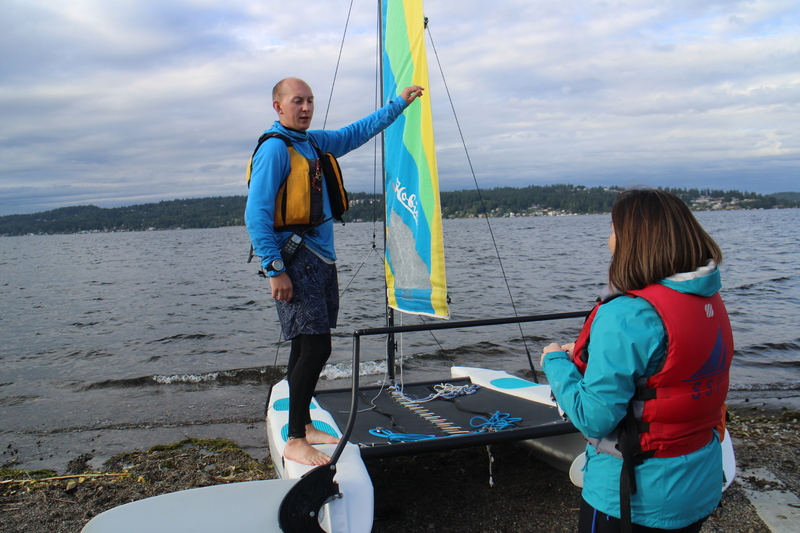 New sailors at Sail Sand Point must pass a Skills Test before using sailboats. Skills tests are conducted based on instructor availability and may sometimes be limited due to volume of skills tests currently being performed and weather, so please plan accordingly. Feel free to call ahead to see what availability is like. Skippers who are not ready to complete a skills test can sign up for one of our classes, private lessons, or take a free refresher lesson. Only the skipper needs to pass the skills test (not crew). You need a skills test for each type of sailboat you want to rent. Skills tests can be taken during Open Boating hours, based on staff availability. Skills tests are for 5 knot increments of wind speed up to 20 knots. Sailors are checked out at the wind speed when they take the test, and anything lighter. In order to take the boat out in stronger winds, sailors must complete the skills test again including the capsize portion. Participants under the age of 14 must have a parent or guardian present to participate in Open Boating. The parent or guardian can be on the same watercraft as the child, a different watercraft on the water, or on land.